Although we love our pets, the last thing any of us want is our home smelling like a litter box. Being a pet owner means cleaning up after your pets, sometimes every day. No matter how well you train your pets, accidents can and will happen. Using a homemade pet stain remover to clean up those messes will save your house from permanent stains, but will also save you money. 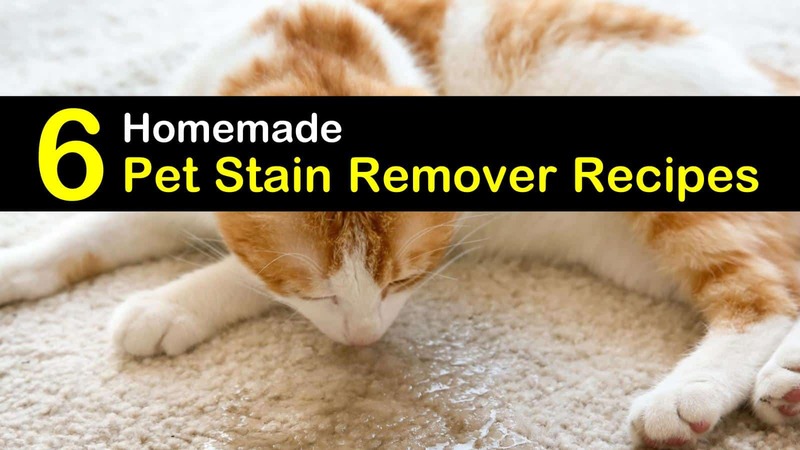 One of the great things about homemade pet stain removers is they are quick and easy to make. Most of them call for simple ingredients that you already have around your home. DIY pet stain remover recipes are safe to use around your house; they will not harm your pets. The best part is these stain removers do not require the use of a carpet cleaner to remove any lingering stains and odors left behind by vomit, hairballs, or urine. One of the worst parts of pet stains is the carpet odors they leave behind. Some pet stain removers get rid of the stain, but they don’t touch the smell. This pet-friendly recipe is a stain and odor remover. Pour enough white vinegar over the stain to saturate the area without making it soggy. Sprinkle baking soda directly on top of the vinegar. You should hear the baking soda start to crackle and see it fizzing. Place a large dish over the stain and let it sit until dry, usually a day or two. Sweep up baking soda and vacuum area. Homemade pet stain removers use natural ingredients to remove carpet stains and odors. Using natural ingredients to remove pet stains means you are not exposing your beloved pets to any harsh chemicals. With paper towels blot the stain until dry. You may need several paper towels to soak up all the pet urine. Mix vinegar with water in a large bowl. Pour the cleaning solution on the pet stain and scrub; this will allow you to reach the bottom of the carpet fibers. For horrible urine stains or smells use 100% vinegar. With the stain still wet sprinkle on a generous amount of baking soda. Using your hands or a scrub brush, rub the baking soda down into the carpet. Allow to dry and then vacuum to remove baking soda. Drying time will vary based on how wet the area is. You want to clean up vomit as soon as you see it. Vomit is full of stomach acid, which stains surfaces quickly. Scoop or scrape up any large chunks of vomit before using a liquid solution. Mix vinegar, warm water, salt, and liquid dish soap in a bowl. Dip a clean rag into the liquid cleaning solution and apply to the stained area. Do not rub the solution into the stain, instead blot gently. Continue blotting until the stain is gone. Dip a clean towel into clean water to rinse away stain remover. Cat pee is one of the hardest carpet odors to remove. You can learn how to get cat urine smell out of carpet, but it will require several steps. With an old towel absorb as much of the urine as possible. Sprinkle area with baking soda and allow to sit for 10 minutes. Drizzle vinegar over baking soda and allow to fizz for several seconds. Blot area with a fresh, clean rag. Repeat until the area looks clean. Make a DIY pet stain remover with three tablespoons of hydrogen peroxide and two drops of liquid dish detergent. Pour mixture directly onto stain and rub in to scrub the fibers. Blot liquid away as soon as possible to prevent carpet discoloration. For hardwood floors, pour the solution into a spray bottle, spray area, then wipe clean. Allow area to dry, use a fan for faster drying time. After the area is dry (about 24 hours) apply an enzyme cleaner to prevent the uric acid from recrystallizing. Allow the enzyme cleaner to dry naturally and clean the area as usual. Reapply enzyme cleaner weekly, if needed, until stain and odors are gone. Although it’s challenging, you can remove old urine stains from carpet, but the trick is finding them first. A simple way to see old urine stains is with a black light. Directly shine the light over the carpet, and it will show where urine is still present. Look for darker discolorations in carpet or a yellow or greenish tint to the flooring. A musky odor can also alert you to urine stains in the home. Once you have found old urine stains, you will need to eliminate them with one of our homemade pet stain removers. One part water combined with one part vinegar can help break down the urine, while baking soda will help remove any odors. Several methods may be needed to remove the stain successfully. Enzyme cleaners are necessary to break down odors and stains at their basic level. Many commercial cleaners use enzymes as one of their main ingredients, so make your own. Add brown sugar and citrus peels to a large glass container. Add water and then secure jar with lid. Give the container a good shake, then loosen cap to allow gases to escape. Allow to sit for three months, then strain, and use as needed to remove cat or dog urine stains and odors. Thank you for reading our cleaning tips for pet stains and odors. 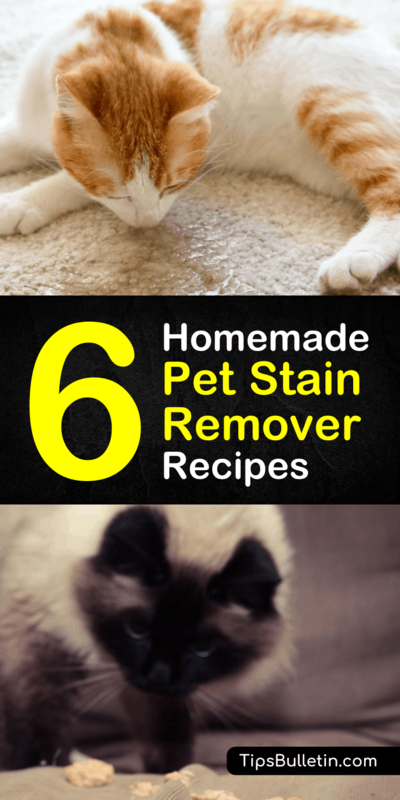 If you found our homemade pet stain cleaners helpful, please share these stain removal recipes with others on Facebook and Pinterest.